The company will pull off some of the brick exteriors on the Amgen buildings it purchased as part of a plan to maximize the views — and the appeal to potential recruits it hopes to attract to the 4,500-employee planned campus. Expedia expects to transform the stout, brick-clad former lab buildings on its waterfront Seattle campus into airy, bright offices with floor-to-ceiling glass, with construction work starting this fall, company officials said Tuesday. The Bellevue-based travel giant released a first look at its vision for redesigning the 40-acre former Amgen Helix campus it acquired last April. By 2019, when Expedia plans to open its new campus, the company expects to have 4,500 employees working there; it has just over 3,000 now in Bellevue. The planned transformation includes what Expedia calls “The Nexus,” a new four-story atrium for company meetings and events, and “The Courtyard” encircled by a 600,000-square-foot, four-story office building. When it opens, the campus will have 800,000 square feet of finished space and an additional 400,000 square feet of unfinished shell space for future growth, said Mark Nagle, Expedia’s vice president of global real estate and strategic sourcing. 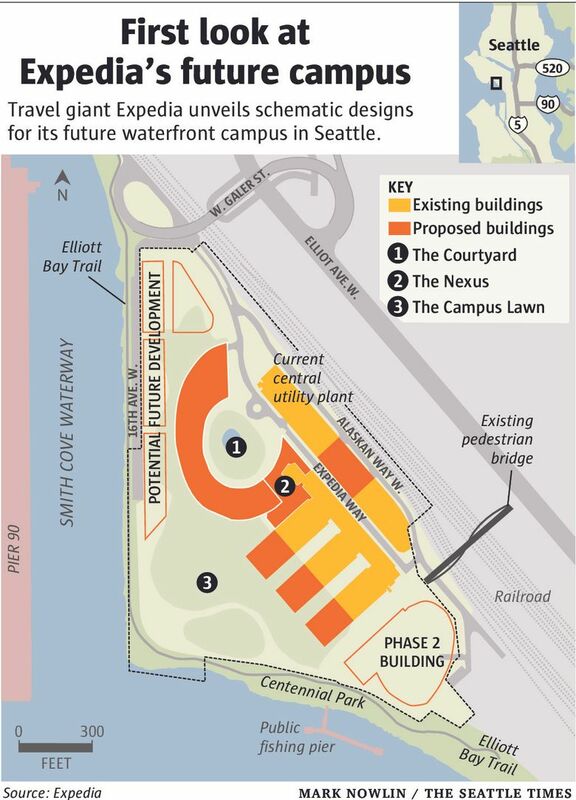 The company said it wants the campus to feel somewhat like a college campus, with individual workstations, collaborative areas and “fun” areas, including sports fields, all oriented toward Elliott Bay. The campus design will include playful elements that evoke surprise and intrigue, Nagle said. “If we’re going to attract the best and brightest, this is how we’re going to do it,” he said. As a ship’s horn blared on the bay and a commercial jet flew overhead, Nagle pointed to the tracks just east of the campus on which trains run daily. The Helix pedestrian bridge over the tracks connects the campus to bus stops on Elliott Avenue West. Nagle said the company’s design consultants were asked to emphasize access to views and light for all employees. One way is removing the brick cladding from the existing buildings and connecting the airy spaces between them with green atriums and bridges. Another is an active campus lawn between the office buildings and the public bike path fronting Elliott Bay. But one task Expedia has for its design team is finding an elegant way to define the boundary between public and private spaces. The company wants its employees to be able to enter and exit the campus at several points along the bike path but also needs to maintain security for the campus, Nagle said. Access to the bike trail is a key component of a broader plan to reducing the company’s peak single-occupancy vehicle trips from 59 percent now to 49 percent by 2019. At that point the campus will have 2,670 parking stalls. Expedia’s future move to the corridor already has some local residents worried that the city’s peak-hour congestion will go from bad to worse. Nagle said the company expects to file its site plan with the city next week. As part of a “major phased development” under the city’s land-use code — a nonresidential, phased complex of buildings that can receive city permit extensions for up to 15 years — Expedia will seek the city’s blessing to build out an additional 415,000 square feet in a second phase and 315,000 square feet in a third phase. Expedia said its goal is to preserve nearly 40 percent of the campus as open space. The company will refine the designs and finalize them by early fall before construction begins, Nagle said. The new campus is being designed by the Seattle office of Bohlin Cywinski Jackson (BCJ) in conjunction with Studios Architecture and PWP Landscape Architecture, according to Expedia. BCJ’s past projects include Seattle City Hall, Pixar Animation Studios in Emeryville, Calif., and Seattle Public Library’s Ballard branch. Studios, the interior architect, created a new newsroom in Manhattan for Dow Jones, a new global technology campus for MetLife in Cary, N.C., and a master plan for LinkedIn’s proposed new campus in Mountain View, Calif. The landscape architect, PWP, contributed to designs for LinkedIn’s proposed campus and is perhaps best known for its work on the National September 11th Memorial & Museum. Bellevue-based GLY Construction is the project’s general contractor. GLY’s past projects include the Adobe Corporate Campus along the Fremont Cut and several buildings occupied by Amazon.com and Microsoft.